In December of 2016, an average of over two million blog posts were created each day on the WordPress platform alone. 10 years ago, that number was approximately 60,000 a day. Great content that is tactfully promoted to the right audience drives business goals—thus, the typical marketer’s response is to create more content, more frequently, and distribute to more places in an attempt to accelerate their business goals. This marketing mindset created demand for content creators, which means more people dabbling in the space and causes confident industry professionals to raise the cost of their content. As the cost of content rises, it becomes more important to understand whether your investment is driving noticeable return—since content returns could take 12 to 24 months to come to fruition, this leaves impatient organizations frustrated with performance and less likely to invest in content appropriately. Even when budgets are cut, content process expectations can remain—that’s when content marketing performance can become underwhelming and downright stressful. Often, the ongoing demand for content means marketers concentrate less on content quality, performance metrics, and building genuine distribution relationships—and as this trend continues, noise is ever amplified. Nobody wins. In the past, this low quality “content machine gun method” would attract site traffic and trick search engines into elevated site rankings, even when readability and user-friendliness were low. While it may have frustrated consumers, it made money. With the competition today at an all-time high, Google and other search engines no longer reward crappy content—and today’s consumers certainly don’t convert as well as they did in earlier days. Now the content marketing conversation has shifted to concentrate on high quality, metrics-driven content to fight the noise, but not everyone understands what it takes to create content of that quality. Executing content programs well takes time, strategic consideration, trial and error, and patience—elements that aren’t easily attributed to moving the needle. Since you’ll be hard-pressed to find success with a 400-word blog post or a two-hour content effort, the expectations of executing high-performance content need to evolve. The best-performing content has a significant strategy behind it. Think topic research, interviews, tone of voice, audience demand, influencer outreach, social and PR elements for shareability and reporter interest, search engine optimization, user experience, design, paid outreach, repurposing, and much much more. To find content marketing success in 2017, concentrate more on the elements that make your content resonate with your audience and less on pure content creation for the sake of keeping up with production standards. 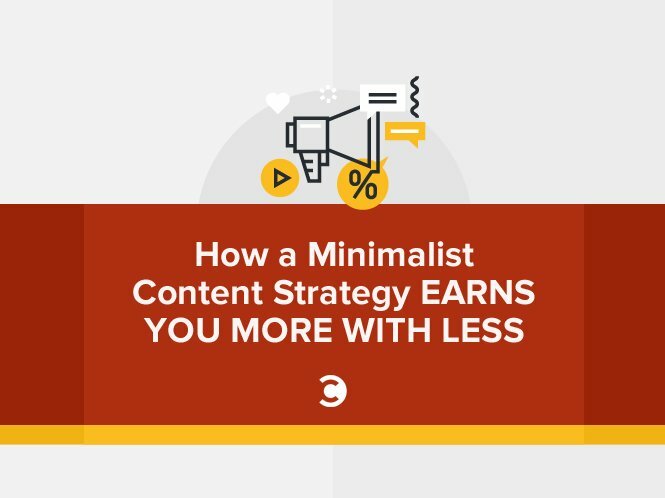 Learn how to build minimalism into your content strategy from the early days and how to scale your efforts back if you’ve gone too far with few results. Investing in content marketing is an exciting time for many organizations. Content is trendy, it’s “digital age,” it’s what all the influencers are talking about; however, it’s not as straight-forward as many may make it seem. While it’s generally accepted that content marketing takes time to yield return, some marketers and leadership teams make the mistake of trying to expedite the return of their content efforts by increasing their marketing spend too aggressively. This is a huge red flag. Before opening the floodgates on your content efforts, your marketing department should make sure that they have consistent control over the following elements. To scale effectively, content marketers should have a clear direction for what they are creating. According to Content Marketing Institute, 81 percent of the most successful content marketers have a clear direction for their content. Start small and be patient. Create strategic purpose by crafting an outline of your key business objectives and customer needs. Then hold a meeting with your marketing shareholders or department leaders and craft a detailed plan for how you will use content to address your audience. At this stage, be sure to discuss brand guidelines, company tone, and content themes that your audience may be interested in learning about. This will help your team stay more aligned as you move towards executing your plan. Much of the content creation process relies on the abilities of the people on your team or the resources available to your department for outside help. When first launching a content strategy or initiating new content priorities, you typically get two types of marketers. The strategic thinker, who wants to plan every piece of content and get the most out of a polished product. They’re more likely to concentrate on developing quality content, hire a long-term outsourced partner, and build industry relationships, but can be slow to deliver results. The tactical thinker, who has a go-getter attitude, can produce content quickly but typically creates a less polished product that may be off-brand or ineffective at first. Over time, their efforts improve, but they can be subject to stress and burnout when producing at a high rate. They’re more likely to hire cheaper freelancers to finish projects and get tasks off their to-do list. So which is better? You need a combination of both to execute optimally, but in the early stages, lean towards hiring a strategic content leader, followed by supporting tactical professionals. Strategic marketers can do more with less and extract more out of your marketing budget. They set ground rules, outline distribution channels, understand performance measurement, consider budgetary needs, and build repeatable processes for more tactical producers. A strong strategic foundation is critical for scaling in a cost effective manner. Content marketing can be messy—an evolving battle of learning from your audience and catering to their needs. As soon as you have a strong grasp, things change. Audiences expect more, a Google algorithm affects your rankings, or a new competitor offers a steep challenge. While it can be difficult to predict the future, the takeaway is that content marketing is a fluid process, and you should consider investing accordingly—yes, this means scaling back from time-to-time. If you aren’t feeling confident about your current content quality, scalability, or performance path, consider slowing down and re-focusing your efforts. Taking a quarter to reassess your strategy can help you identify a stronger solution to gain market share on your competitors and better relate to you customers. Look at your marketing team’s maturity, set obtainable goals and key performance indicators to build team confidence, empower your department to collaborate in a low-pressure environment, and take a deep breath—concentrate on what you can accomplish with your current resources to build processes to ensure long-term success. Have you been overwhelmed by the pressure to constantly create marketing content? Have you found that this stress has impacted the quality of your work? What steps have you taken to make sure that your content stands out from the crowd? Put your answers and any feedback that you may have in the comments section below. Jacob Warwick is the founder of ThinkWarwick Communications, a strategic marketing company in Northern California. He specializes in content strategy and public relations for B2B software and tech organizations. Reach him on Twitter or on LinkedIn.